The road began to bend up ahead. Kate deftly maneuvered what turned out to be a pretty sharp turn in the road, when suddenly a deer came running across the freeway. Kate reacted quickly. She noticed the deer was moving so quickly that by simply slowing down, she would miss it. Suddenly, however, Kate felt her body jerk forward against her seat belt. Kate was startled, she had no idea what was going on. A spike of pain shot through her neck as she swung forward in her seat. In an instant, everything was still. Examining her rear-view mirror, she realized the car that had been following close behind her was not able to brake in time and had rear-ended her. Slowly Kate got out of the car. Her movements were slow and deliberate. The entire bumper of her car was smashed in. Kate put her hand to her face and began to rub her eyes slowly. She took a deep breath and sighed. Because she didn’t know the guy who hit her, she was insistent that they call a state trooper to issue a formal report. The operator on dispatch said that it would be a while before the patrolman was able to get there. In the meantime, they would just have to sit and wait. Kate’s stomach growled. She was hoping to have been at her parent’s house by now eating dinner. As she went to call her parents, she realized her battery on her phone was almost dead. She didn’t have a charger. Kate was mad about the accident and also mad that she was caught so ill-prepared. Unfortunately, Kate’s situation is quite common. People get stuck on the side of the road for various reasons, whether from an accident, like Kate’s, car troubles, or others. For example, in Kate’s case, calling the police was the right thing to do. She did not know the man who hit her. Many personal injury attorneys recommend calling the police after an accident in these types of situations. While Kate couldn’t have done much to prevent the accident on her end; she could have been a little more prepared for its after-effects. Often people get stuck in their cars only to realize they aren’t prepared to wait for an extended period in their cars. The following are a few suggestions of what you should do to prepare your own personal car safety kit. Obviously, you should customize this list based on your needs. Take some of our good ideas and add to them. The idea of having something ready to go in case of an emergency is crucial! It can make a small difference amid bad circumstances. Whenever you are making a prevention kit, the goal is to think of possible hypotheticals where you might need something. This list is not intended to be complete; rather, it can help get wheels spinning so that you can create your own list to suit your needs. Cell Phone/Charger. Having your cell phone with you probably seems like a no-brainer. But having a charger is another story. How often have you been somewhere and had to ask to borrow someone else’s charger, or had someone ask you to use your charger? Having a functioning cell phone is imperative if you get stuck somewhere. If for whatever reason, you get stranded, a functioning cell phone will allow you to call for help. With your phone, you can call the police. You can notify your insurance company. You can tell your parents, spouse, friends, etc. why you are going to be late! It is hard to know how long unforeseen inconveniences can take. For example, Kate waiting for the highway patrolman to show up could have taken fifteen minutes, or it could have taken over an hour. You do not want to be caught in a situation where your phone is about to die, and you are stuck waiting for someone. The flashlight on your phone can be especially useful when it is dark. If you have to change a tire, locate your insurance information in your glove compartment, or pull something out of your trunk, having your cell phone to use its flashlight can be beneficial. Jumper Cables. Although this did not apply in Kate’s case, having jumper cables is something that can avoid a ton of headache. It is very difficult to know when your car battery will need a jump to get moving. Jumper cables can not only help you but others who are in sticky situations with their car battery. When packing jumper cables in your emergency kit, remember, owning a pair of jumper cables is one thing, knowing how to work them is something else. Using them incorrectly can be dangerous. Therefore, it is important to have either an instruction manual or a working knowledge of how to properly use them. Reflective Materials. Anyone in a situation similar to Kate’s would be helped tremendously in having some reflective material. There are a variety of situations that would require you to pull over to the side of the road. If it is night time, this can make parking on the side of the road perilous, especially if there is not an adequate shoulder. Having a reflective vest, some flares, or other items that can alert oncoming traffic to your presence can contribute to your safety. Winter Supplies. If you are ever traveling in an area where there could be the possibility of snow or cold weather, always prepare accordingly. In the case of an emergency in a winter area, having the proper supplies could save your life and the passengers as well. Winter items might include things like an ice scraper for your windows, ice melt or cat litter to help get your tires moving if you get stuck, warm clothing, a shovel, etc. First-Aid Kit. 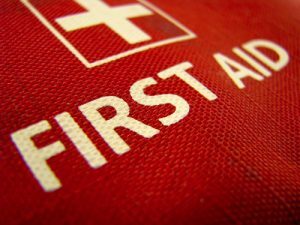 A first aid kit can provide immense help in certain situations. With a first-aid kit, certainly, the hope is that you never have to use it! Just googling “first-aid checklist” will bring up an assortment of suggestions for what to include in your first-aid kit. Many stores sell extensive first aid kits that include more items than you would ever need. Similar to your car safety kit, a first-aid kit can include things that meet your needs. Warm Clothing. This suggestion can apply to everyone, no matter the climate. Even in some of the hottest parts of the country, the temperature can drop significantly during the night hours. Even if the temperature is not low enough to jeopardize your health, having some warm clothing, a blanket, or something to keep your body warm can help you be more comfortable. Water/Snacks. This suggestion is relevant in Kate’s case. Water is a little challenging simply because keeping it in your car for long periods of time can make the water taste a little off. Water doesn’t go bad, but many of the bottles it is kept in can expire. Next time you grab a bottle of water, notice the expiration date. Also, having a variety of snacks to eat while you are waiting can also improve the situation. This suggestion becomes even more important the longer you wait. Make sure they are snacks that you like. If you hate granola bars, don’t feel like that is what you need to pack because everyone packs them. Choose something that will last for long periods of time before you have to change them. For example, dehydrated food packs, trail mix, cereal, granola bars, etc. all typically make good snacks to keep in your car. Proper preparation can make a potentially grim situation less unpleasant. A car safety kit is something that people typically don’t think about until they need it. No matter how new or reliable your vehicle may be, there is always a chance of breaking down, an accident, or other reason that will require you to wait with your car. Even if you do not regularly drive to remote areas where there isn’t access to many basic items, you still want to be ready in some form. For example, Kate’s situation could have greatly improved if she had prepared beforehand.